Love knows no boundaries. Nothing on earth can stop lovers from reaching out to each other. Differences in culture or faith cannot prevent them from attempting to unite across the barriers the world’s political powers erect. They’ll always find a way to open to the speech of heart, even if music and poetry are sometimes the only way of presenting their emotions. In our time, walls have been erected that sometimes make it difficult to meet, particularly when the lovers come from countries that are declared enemies. Recent developments in both the US and Iran have, however, lit the light of hope. There is a “Scent of Reunion” in the air after the inauguration of the new president in the US and the emergence of a vital and brave opposition in Iran. Reconciliation and reunion is a flickering possibility between individuals as well between “the New World” and the ancient Persian realm. Iranian artist Mahsa Vahdat and Norwegian producer and poet Erik Hillestad met through the project “Lullabies from the Axis of Evil” in 2003. Their cooperation on many projects led to a meeting between Erik and Iranian poet and visual artist Mohammad Ebrahim Jafari. With Mahsa, they arranged a poetic workshop in Vence in Provence, France, in December 2008. The exchange of ideas became the lyrics of love duets, and the lyrics were given melodies by Mahsa Vahdat, Sigvart Dagsland, Knut Reiersrud and Jarle Bernhoft in the spring of 2009. 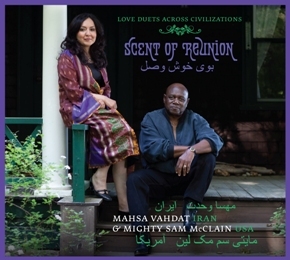 Well-known American blues artist Mighty Sam McClain rose to the challenge to perform the duets with Mahsa in June of the same year. Featured on the “Scent of Reunion” CD, subtitled “Love duets across civilizations”, are Knut Reiersrud and Jarle Bernhoft – arrangements, guitars and electrical piano. On double bass, vibraphone, piano and trumpet – Mathias Eick, on drums – Rune Arnesen and on the ney flute – Pasha Hanjani from Teheran. The recordings were made in Kulturkirken Jakob in Oslo (Norway), in Fin Studio in Teheran (Iran) and in Cedarhouse Studio in New Hampshire (USA).